Our executive chef has created innovative menus to showcase some of Scotland's finest product, much of it sourced locally. Indeed, we are so proud of our longstanding suppliers that they are listed on our menus. Our extensive wine cellar is stocked with exquisite wines and champagnes with expert advice from our sommelier. We offer a choice of eating spaces. Our airy, open-plan conservatory, intimate dining a deux, and, when weather permits, breakfast and lunch on the terrace. Six stylish conference and banqueting rooms provide dining and conference facilities for 2 to 400 persons. The wine cellar holds more than 400 choice wines, chosen from around the world, and the Drawing Room bar which is stocked with more than 100 choice malt whiskies. The Drawing Room Bar and Lounge features many original paintings by Scottish artists, as well as a fascinating array of artefacts collected by the Spence family over the years, including a display of 140 cheese dishes - collected from all corners of the globe. The focal point of this splendid drawing room is the baby grand piano which is festooned with a pictorial record of some of the many VIPs and celebrities who have visited and stayed in our hotel since it opened in 1993. With a real log fire burning invitingly, our guests and visitors find the Drawing Room an ultra-relaxing retreat - for morning coffee, afternoon tea or for joining friends and colleagues for drinks before and after lunch or dinner. 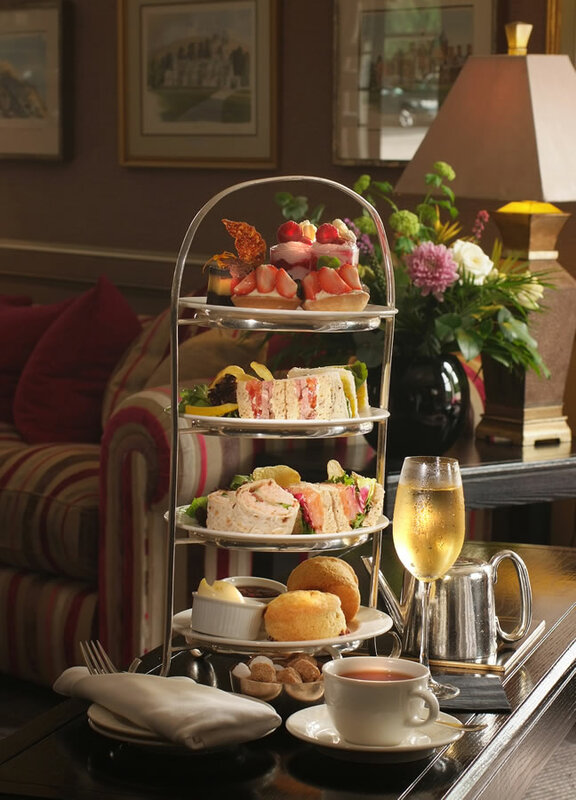 Afternoon tea was introduced in England by Anna, the seventh Duchess of Bedford, in the year 1840. The Duchess would become hungry around four o'clock in the afternoon. The evening meal in her household was served fashionably late at night at eight o'clock, thus leaving a long period of time between lunch and dinner. The Duchess asked that a tray of tea, bread and butter (some time earlier, the Earl of Sandwich had the idea of putting a filling between two slices of bread) and cake be brought to her room during the late afternoon. This became a habit of hers and she began inviting friends to join her. Please be advised that due to popularity bookings are required for afternoon tea.